In our second partnership with One Acre Fund, we’ll be following David and Zipporah, smallholder farmers from Kenya, for a whole growing season. From planting to harvest, we will check in every month to see what life is really like for a family making a living from agriculture in rural Kenya. Read part 1, part 2, part 3 and part 4. Written by Hailey Tucker. David and Zipporah with their maize and beans growing in their field. Credit: Hailey Tucker. Zipporah looks out over her field of maize, surveying the rows. The plants, which were planted one month ago, now reach just above her knees. Despite a recent lack of rain, the maize is growing strong. Zipporah and her husband David say they aren’t too concerned—yet. The couple makes their way through the rows, observing the current state of their maize, beans and peanut crops. Before the sun sets, they move inside to begin their evening activities. Zipporah heads off to the single-room kitchen that sits annexed near the main house, and David goes through the front door into their living room. As the daylight dims, the mud-walled structures light up from within. 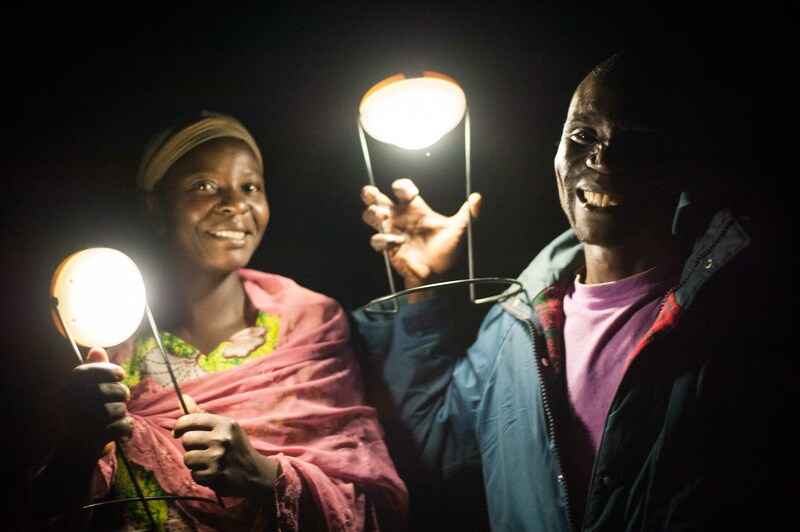 David and Zipporah don’t have electricity, but they do have solar lights. They bought their first Sun King Pro solar light in 2013. The light, made by Greenlight Planet, was purchased from One Acre Fund on credit. This year, the couple took advantage of the opportunity to purchase a second, improved light, the Sun King Pro 2, which they received from One Acre Fund last month. Zipporah and David hold the two solar lights in the darkness. Credit: Hailey Tucker. “It has been so nice having two now because I can use the older one in the kitchen while the family can use the other to light the rest of the house,” Zipporah says, stirring onions above an open flame. Prior to having the solar lights, the family would use 1.5 liters of kerosene for each week of light, costing them 135 Kenyan shillings ($1.55 USD). Over the year, this would total 7,020 Kenyan shillings ($80 USD)—enough money to purchase improved seed and fertiliser for their entire farm for one season. Now, with the lights, David and Zipporah can allocate those shillings to school fees for their four children. Zipporah cooks by the light of the Sun King Pro 1 they bought in 2013. Credit: Hailey Tucker. The couple has also started to lend their Sun King solar lights to the community for funerals, saving grieving families the added burden of purchasing kerosene for the traditional multi-night ceremonies. David sits in the house with the children as they complete their homework. Their eldest, Andrew (14), says his grades at school have improved since they got the solar lights. With hopes of becoming a lawyer, Andrew says he knows his grades need to be good, so he appreciates that the new light might help him get there. Andrew’s social study notes as lit by the Sun King Pro 2 in the living room. Credit: Hailey Tucker. The family also praises the solar lights for their health and security benefits. A year ago, David even caught a thief during the night with his solar light and turned the robber in to the police. “The thieves now know I have security in my home, so they don’t come,” David says. The family shifts around by the light of their lamps late into the evening. After dinner, the children are allowed to take one light into their bedroom, while David and Zipporah rig up the other light for security for the night. Early the next morning, Zipporah is happy: the light is still on. The children study inside the house by the light of the new Sun King Pro 2, which David has hung from a ceiling beam. Credit: Hailey Tucker. Have you got a question or message for David and Zipporah? Leave a comment below. We’ll get in touch with them and answer in the next installment.